"Average data consumption increased from about 90 MB per month during the first quarter of 2009 to 298 MB per month during the first quarter of 2010. This represents a year-over-year increase of approximately 230 percent. While this increase is substantial, in the first quarter of 2009 more than a third of smart phone subscribers used less than 1 MB of data per month; this number has dropped to a quarter in the first quarter of 2010 as the number of applications and the utility of smart devices has increased substantially. 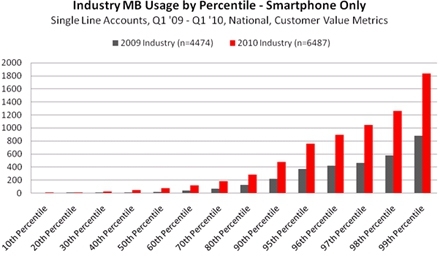 That means about 20 million current smartphone users are hardly using data." Recently, AT&T caused an uproar when they introduced new tiered pricing plans for its customers. Previously, AT&T offered an unlimited plan for $30/month. As of June 7th, all new subscribers are required to choose from the DataPlus plan, or the DataPro plan. The lower priced DataPlus plan offers 200MB of data per month for $15, while the DataPro plan offers 2GB of data per month. A recent analysis by Roger Entner at Fierce Wireless shows that even today, most consumers are better off under tiered plans.Of course, when this news originally hit the wire, the most outraged group of users were those who consumed the most data. Data released recently by the Nielsen group reveals that the top 6% of users are consuming half of all data used. In fact, 23% of smartphone users use exactly 0MB per month, and more than a third of smartphone users have not even signed up for a data plan (these users signed up before the operators required data plans). The one questionable variable for consumers is the year-over-year growth rate. From Q12009-Q12010, the growth rate was a staggering 230%. At that growth rate, in a couple of years consumers could be averaging almost 2GB of data. A number of developments could make that extrapolation a reality. What will happen to usage rates when Hulu and other video providers are finally provided to smartphone users? If video calling becomes more prevalent (over 3G as opposed to WiFi) usage could drastically increase. One of the big draws of Windows Phone 7 is the connected nature of the phone. If the Kin Studio is integrated into Windows Phone 7 as many (including myself) hope to see, automatic backup of videos and pictures could also increase usage. The bottom line is that as our smartphones and software evolve, usage will increase for normal and power users alike. It will be interesting to see how the operators respond to these usage increases over the next couple of years. For now however, it looks like your best bet is to stick with a tiered plan where possible. I was faced with a similar issue myself recently: when the iPhone came out in Canada, it brought with it affordable data for the first time: $30 for 6 GB of data transfer. I jumped all over that. A few months ago though, I wanted to get my wife off of using Telus (CDMA carrier) and on to using Rogers (a GSM carrier). A family plan was the best way to reduce our costs across the board, but Rogers had completely eliminated the $30/month data plan...the ONLY option they'd give me was a $100/month plan for the two of us (which ballooned to $125/month after adding voicemail and caller ID, features which were stupidly not considered "core"), and it has only 1 GB *shared* between us. The geek in me chaffed hard at giving up my 6 GB/month plan, but the pragmatist in me looked at the data I'd been using, which at most was 700 MB/month (my wife only does email on her phone, her data usage is like 30 MB/month), and realized that this was the smart decision.